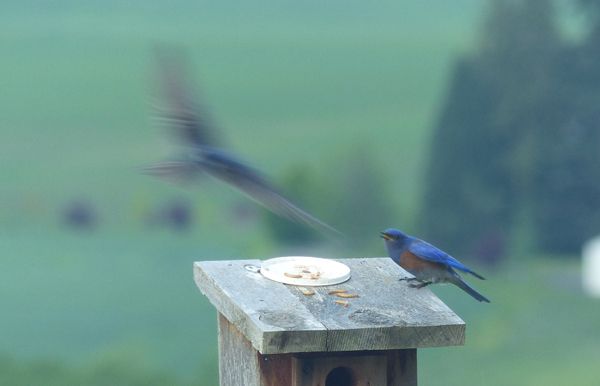 Bluebirds Compete with Swallows for Nest Boxes ! Bluebirds and Swallows will compete for shelter! It was a cool and misty morning in Dundee when I arrived to band a brood of nestlings in the countryside outside town. At least six Violet-green Swallows were swooping around the box, including going inside. Both bluebird adults were involved in the fray. Swallows were attacking each other, chasing the bluebirds off, and the lone bluebird pair was trying to keep the swallows away and still tend to their nestlings. Betty and John, PBRP route monitors, arrived shortly to participate in the banding. We took my transport basket to the box and prepared to move the nestlings safely to my car for banding. Swoop! When I tapped and partially opened the box to slide my hand up to prevent them from tumbling out, a bird zoomed straight out of the box. It was so fast and unexpected that none of us could observe the bird closely enough to determine the species. I reassured Betty and John that it was not a bluebird nestling,; they were only 11 days from hatch, incompletely feathered and not capable of the strong, rapid, straight out flight we had just seen. The nestlings will spend another 10 days or more in the box being fed by the adults, growing not just feathers but in size until they are as large as their parents. Then and only then will they be coaxed to leave the box. Even with the parent birds’ care, birds that fledge from the box too early have little chance to survive. Every bluebird monitor’s nightmare is a neighboring property to their route that unwittingly fosters huge populations of swallows. 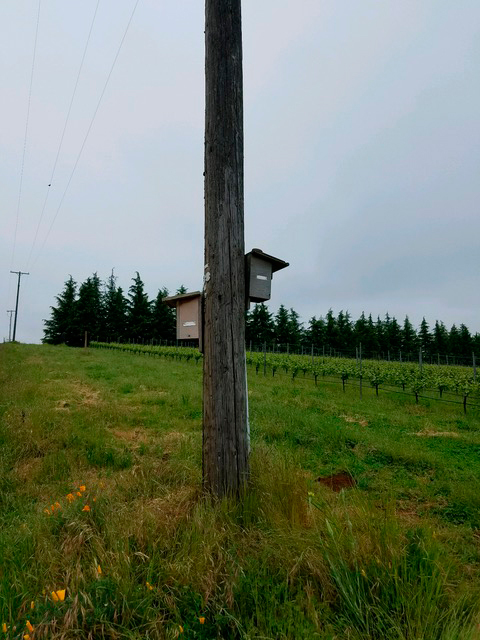 The burgeoning swallow population is hard pressed to find adequate shelter, and resorts to a powerful display of determination to secure a nestbox, even if it is already occupied by a family of bluebirds. Installation of the new empty box on the left. Swallow desperation to find a nest site and their interference with the adult bluebirds’ feeding their young could result in starvation of the nestlings. I suggested we put up an additional empty box to give the swallows an opportunity to build their nest and lay their eggs. Neither of us had an extra box in the car. We put our heads together and determined where on the two Dundee routes there were boxes as yet unoccupied by native birds. Betty and John did all the scouting and found a box on property that had two boxes, one not in use. They moved it to this location and we all crossed fingers and wished the bluebirds well (including the landowner where the required empty box was found and borrowed for the purpose). 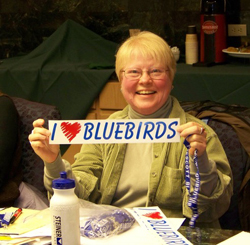 While we wait to see how successful this attempt to salvage the bluebird family will be, we volunteers are changing our behavior. Added to each of our vehicles: an extra nest box and a power drill with batteries charged and ready to go!